Two shows are planned for November. Presenting songs from all three catalogues, Captain Walker, Magnus Hængsle & Jenny Moe will all perform on each other’s songs. 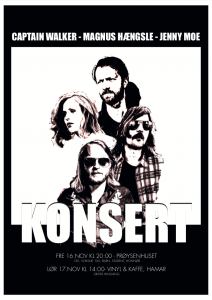 Nov 16th at Prøysenhuset, Ringsaker, and Nov 17th at Vinyl & Kaffe, Hamar. 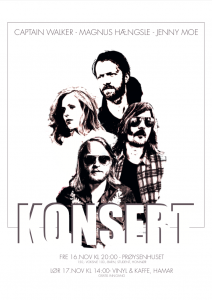 Nov 17th at Vinyl & Kaffe, Hamar. Copyright © 2019, CAPTAIN WALKER. Proudly powered by WordPress. Blackoot design by Iceable Themes.